Each late September, as the season changes and we say goodbye to summer and welcome to the holidays ahead, it is time to make magic in our commercial kitchen. This is our special Cranberry Balsamic Spread, only made for Thanksgiving and Christmas. 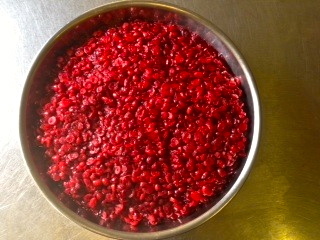 Have you ever seen such a big bowl of cranberries? Delicious as a condiment on the table for the big day, divine with ham or turkey, easy peazy appetizer with goat cheese or warm brie (above) and yummy spread on grilled panini anything. Happy Thanksgiving! Get these little ruby red jars of goodness, while you can! Eggplant is easy to find this time of year and often more inexpensive than bell peppers have been. This is an easy side dish to serve with some quinoa. This recipe calls for capers, but if you don’t like them, use pecans or almonds for a different texture and taste. Heat half the oil in a 12″ skillet over medium-high heat. Working in batches and adding more oil as needed, fry eggplant, flipping once, until golden-brown, 5–7 minutes; transfer to paper towels to drain and season with salt and pepper. Arrange on a platter; drizzle with edible gardens Balsamic Reduction; garnish with (optional) capers and fresh basil. Penticton Farmers Market is ON! Every Saturday in Downtown Penticton. Don’t let the construction get in your way ! See you then at our usual booth. Our favourite time of year to see all our loyal customers again! YAY! Who doesn’t love a gooey grilled cheese on a winter day? I grew up on them, and still love this comfort food when the weather is cool. Offer your grilled sandwich with a small dipping bowl of our rich, dark 18 year Reserve Balsamic, to really punch up this favourite winter snack! You will love the savoury taste! Remember you can order your 18 yr Reserve, or any other of our wonderful products on-line. Visit our Want To Order? and we will ship from the edible gardens kitchen, direct to your door. Valentines Dessert starts with this main course pizza! 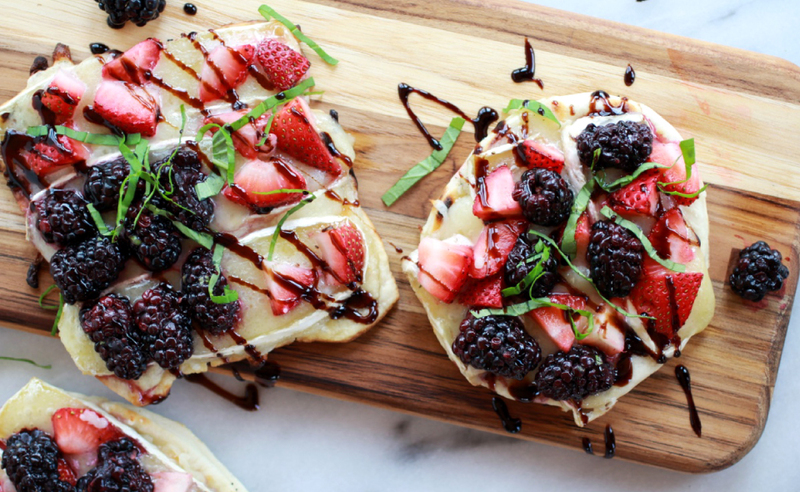 Who can resist the combination of our delicious edible gardens 18 year rich smooth Balsamic drizzled on Grilled Blackberry, Basil, Strawberry and Brie Pizza? This will change your view of pizza after a single bite. Melted Brie cheese adds another layer of deliciousness with the grilled fruit, and our 18 Year Reserve Balsamic, is the perfect finishing flavour. This is great for a late night snack, even lunch and perfect for a Valentines dessert that is fresh, healthy, and doesn’t scream sugar. If you like, a few shavings of chocolate can be grated on top, for those who crave a little more sweetness. The Big Day is less than a month away, and we have all the trimmings for a great holiday dinner at your house. This is a bowl of fabulous ripe red luscious cranberries from the Fraser Valley that I have cooked and slowly married with our cranberry balsamic to create our Coastal Cranberry Balsamic Spread. Try it on mini quiche for a nice presentation and a delightful addition to the cheese and egg. Drop a dollop on a cracker with feta, or cream cheese, or my favourite is warm brie! I chopped some fresh rosemary for the top.